Let's ponder these questions: why did Congress amend the Constitution in 1916 giving it the power to collect taxes on any source? Why was the 17th Amendment enacted in 1913 to select Senators by popular vote rather than, as originally designed, selected by state legislatures? Finally, why did Congress pass the 18th Amendment in 1919 outlawing alcohol sales? To really get into these questions and gain an appreciation for today's rogue Congress and Supreme Court, let's not get bogged down on the merits of these amendments. Let's simply look at the Constitution's restrictions. 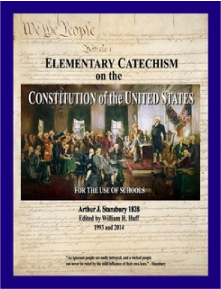 In Article I, Section 8, of the Constitution the Framers enumerated 18 functions of the federal government. Nowhere among those functions was Congress given the power to prohibit alcohol sales. Article I, Section 2 of the Constitution expressly states "direct taxes shall be apportioned among the several states" and forbids direct taxes on individuals. Then there's Article I, Section 3, that requires state legislatures to appoint Senators. During earlier periods, Congress and the Supreme Court had far greater respect for the Constitution. They understood that if the federal government was to have a power not delegated, or expressly forbidden, by the Constitution they had to use the provisions of Article V to gain that power by amendment. They knew, for example, Congress had not delegated power to prohibit alcohol sales. They couldn't find that power by manipulating the "commerce clause" or going penumbra hunting. Today, it's an entirely different story. Congress, the White House and the Supreme Court have abiding contempt for the Constitution and we Americans are left with a constitutional carcass. Take just a tiny comparison of today with yesteryear. Yesteryear there were alcohol prohibitionists; today we have tobacco prohibitionists. No matter what we think about the alcohol prohibitionists, we can have a bit of admiration for them because they used the constitutional route to get their agenda across. Tobacco prohibitionists employ constitutional stealth: taxes, majority votes and the totalitarian tactics of the EPA, and FDA. In 1787, the Constitution would have never been ratified without both the Ninth and Tenth Amendments. "The enumeration in the Constitution, of certain rights, shall not be construed to deny or disparage others retained by the people. ", is the Ninth Amendment and, "Powers not delegated to the United States by the Constitution, nor prohibited by it to the states, are reserved to the states respectively, or the people. ", is the Tenth. The Framers justifiably feared concentration, of power in Washington. Today, the Ninth and Tenth Amendments have been completely trashed and Congress is well on the way to finally trashing the Second and Fifth Amendments. When and how we developed today's constitutional contempt is debatable. The federally-caused Great Depression played a role but the education establishment has played a greater role through the dumbing down of Americans. The resulting ignorance has allowed us to let charlatans and quacks in the legal profession tell us what the Constitution means. The Constitution was not written for intellectual elites; it was understandable to a nation of mostly farmers at the time it was written. So where do we go and what do we do? Each of us is duty-bound to read and understand our Constitution. If we do that we'll realize Washington has little or no moral authority. Its authority rests mostly on intimidation and force of arms. And like the Founders, we should adopt the attitude that "There is one thing in the world more wicked than the desire to command, and that is the will to obey."